The Woodlands Children’s Museum is planning a new Toddler Exhibit! With an interactive ocean theme, our youngest visitors will enjoy crawling through a submarine, practicing movement skills along the wavy walk, engaging in structured play with the ball ramp and raceway, and discovering new shapes, textures, and colors along the ocean-themed mural. 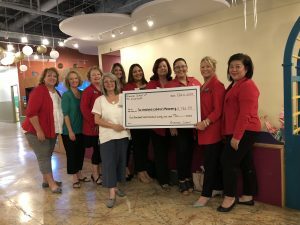 Donations from individuals and area businesses are critical to funding the new exhibit and maintaining it for the thousands of children who will enjoy it each year. A $100 donation will . . . help maintain the aquarium at the front of the exhibit. A $500 donation will . . . help provide books, small vehicles, balls, and other tools that will be used for structured play. A $1000 donation will . . . help provide seating, mats, and cushions within the exhibit. A $2500 donation will . . . help provide soft flooring in the exhibit for children to safely develop movement skills. A $5000 donation will . . . help build a 3-dimensional mural with a variety of textures, colors, and shapes for children to explore. A $10,000 donation will . . . help support the cost of individual elements within the exhibit, such as the wavy walk, crawl-through submarine, and raceway. The new exhibit will be built in 2019 and donations of $5,000 or more will be recognized with a plaque near the exhibit entrance. For additional information, contact Jennifer Kraus at jkraus@woodlandschildrensmuseum.org or contact the museum at 281-465-0955.